You’ve carefully crafted an important email. And now you’re waiting for a reply. But as time passes, you wonder—could your email have been better? Should you have edited more? Could you have tried a different approach? Getting your emails answered may feel like an impossible task. Aren’t all our inboxes overflowing? Aren’t we all trying to empty our inbox quickly? So we can get on with more important stuff, like writing a blog post or playing with our colored pencils? Getting replies to your emails might be easier than you think. Before you send your email, step into the shoes of the person receiving your email, and answer the following questions. 1. Is your goal crystal-clear? Is it instantly clear to your reader what he should do? Whether you’d like your reader to reply with information or click through to buy a product or read a blog post, have one specific goal for your email. 2. Why would your reader care? Most emails don’t explain why the receiver should care about taking action. What’s in it for them? What will they learn? How will you make them feel better? 3. What’s stopping your reader from taking action? Is he nervous about the time it would take to read your blog post or complete your questionnaire? Does he think you’re expensive? Consider how you can take his nervousness away. 4. Can you cut any redundant information? Have you edited your text, so every word counts? Remember, each redundant word slows your reader down, reducing your chances he’ll take action. Want to know how the 4 questions work in practice? Below you’ll find two example emails—the emails are real, but I’ve changed the names of people and companies. For each email, I’ll answer the 4 questions, and show how to make the emails more engaging and seductive. My name is Johnny Depp, Marketing Coordinator for Awesome App. I’m reaching out to you specifically because I have noticed that Enchanting Marketing is an extremely influential resource for eCommerce business owners. I’d like to offer you an exclusive, personal demonstration of the Awesome App platform from our Product Director, Jackie Chan. This presentation will only take 40-50 minutes of your time, and will showcase every part of the Awesome platform. We are not asking for any commitment from you in exchange for this demo. We feel that the Awesome platform is strong enough to speak for itself. Our hope is that after seeing the platform’s innovative capabilities, eCommerce industry influencers such as yourself will take notice. I hope that you will consider giving us the pleasure of demonstrating for you what the Awesome platform is capable of! Please let me know if you are interested in this opportunity. I would love to connect you with Jackie for a private demonstration of Awesome. Jackie is a real eCommerce pro, and will be well equipped to answer any questions you may have. The goal: While it’s clear that Johnny wants to set up a demo, his call-to-action is rather wishy-washy and long-winded. Why should the reader care: Johnny doesn’t tell me what his Awesome App does, and he doesn’t explain why I would be interested in spending 40 minutes of my time for a demo. What’s stopping your reader from taking action? Johnny tries to flatter me into taking action. Flattery often works, but a cookie-cutter approach to flattery doesn’t work. Make your flattery specific. Redundant words? Loads! Why start with telling me he’s Johnny? I’ve seen that already in the “from” field. He rambles on about his app without explaining anything. And the stuff about his boss doesn’t interest me either. I read your fantastic blog post about product descriptions on Shopify, and I wondered—do you have copywriting clients who own ecommerce stores? Please reply to this email and I’ll set up a quick demo at a time most convenient for you. Note: Don’t send an email without editing. And when you edit your email, aim to cut 50% of words. Your reader will be grateful. Thank you for choosing Awesome Holidays for your recent holiday. We know that there are lots of other companies offering activity style holidays, so we are grateful that you decided to travel with us! Hopefully we more than met your expectations – that is certainly what we aimed for, but how did we do? In order that we can continue to develop, and where necessary improve, our services, we would very much like you to share your thoughts with us by completing our on-line questionnaire. It should only take a few minutes and, to show our appreciation, we’ll enter your name into our annual prize draw to win £1000 in Awesome holiday vouchers! Please also take this opportunity to share your holiday experiences with other Awesome customers. You can send us your photos, post your comments and share your experiences via our Facebook page. Our staff here in the office, and future customers will find your comments invaluable. Thank you for taking the time to read this. We very much look forward to receiving your comments and to booking your next Awesome holiday! To begin the on-line holiday questionnaire please click here. The goal: Is this a marketing email or customer satisfaction survey? Do you want to hear my feedback or do you want me to promote you on Facebook? Why should the reader care: Why would I care, if you start with addressing me as Mr? The prize draw might persuade me (it didn’t! ), but the tone of the email lacks compassion. Do you care about my feedback? Or is this just a marketing exercise? What’s stopping your reader from taking action? I hate lengthy surveys (know anyone who loves them? ), and a few minutes isn’t specific enough to reassure me. Will it take me 2, 5, or over 15 minutes? Redundant words? Loads! The sentences are far too long to be readable. Thank you for choosing Awesome for your recent holidays. We’d love to hear your feedback—whether it’s good or bad. Do you have any suggestions how we can improve? Click here to complete our 2-minute online survey now. PS Complete our survey, and we’ll enter you in an annual prize draw to win £1,000 in Awesome holiday vouchers. Note: Don’t muddy your message with multiple goals. Keep it simple. Everyone’s inbox is overflowing. To the brim filled with promotions. Newsletter updates. A couple of business inquiries. And a few emails from good friends. Nobody wants to read the gobbledygook-filled emails. So don’t write as if you’re addressing a faceless crowd. Write as if you’re emailing a good friend. Be conversational. But don’t become a blabbermouth. Because everyone’s time is precious. This is a great guide to writing emails which get results. I have to admit that I don’t put in that much effort as I should a lot of the time. Especially when it comes to trying to keep the email as short as possible. Your strategies about goals and “why should the other person care” are the most important parts of a good email, in my experience. 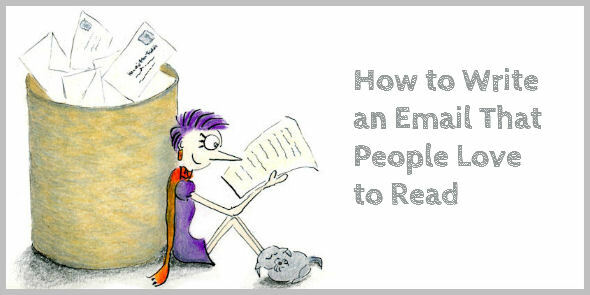 I think clear goals and empathy are the two most powerful primers to an effective email. Having a clear idea of what you are trying to do achieve before writing, and thinking of the other person as you do. Will it inconvenience them, is there a benefit for them, how can I make things easier? I like to think of other peoples interests as well as my own. This usually means both parties get happy outcome. Yes, you make a good point – often we don’t put in the effort and quickly dash of an email. But it’s a little disrespectful to the people who are receiving the email. When we don’t make time to write a clear email, readers have to wade through the mud to find out what we want from them. I agree with you – the two first questions are most important. When you stay focused on your goal and why your reader should care, then you’re nearly there. I am going to write you a fascinating email this instant! A great post as usual with crystal clear examples. Thank you. Thank you for stopping by, Véronique. Hurray. If timing is everything then you are the best timer! Your 4 tips helped me write my first email ever, to a new prospect, that really worked. I love your tips and use them frequently. Sorry it’s in Dutch but use Google translate then you understand my message. P.S. the sun is shining and I can climb on my panthers this afternoon. Feeling free because my mail has had success! Thanks very much. Fijn dat we gisteren uitgebreid met elkaar hebben gesproken. Jouw verhaal over LeukBedrijf en ActiefBedrijf heeft mij aan het denken gezet. De uitkomst van dit nadenken deel ik graag met je. Voor nu – gratis en ter kennismaking – herschrijf ik eerst een aantal pagina’s van de ActiefBedrijf website. Zodat je de stijl en aanpak van Fleur leert kennen. Dan hoor ik graag of het bevalt, en leg ik uit waarom mijn teksten werken. Wanneer heb je weer een half uur tijd in je agenda? Yay! Congrats, Fleur. Your emails is engaging and to-the-point. Well done. Just what I need. Thanks a lot. We all have plenty of time, but we do not want to waste it. Perfect timing, as usual Henneke. (In my home we call this God’s timing.) I needed to finish writing an email for prospective clients. I put it through your test. Slashed a bunch of it and added clarity. Feeling good about it. Great! Glad the test worked for you, too. I’m more than a little embarassed at how much sense your article makes, and yet how rarely I put those ideas into practice when I’m writing to attract business. Your two meh examples are like a guy who wants to ask a girl out but is clumsy in his approach (likely due to low emotional intelligence). Your two enchanting examples are like a guy who wants to ask a girl out but realizes that other guys are also asking her out, and that she may or may not be in dating mode at the moment. Thank you for a short but extremely useful (and versatile!) post! I’ve bookmarked it and emailed the link to myself for future reference. Yes, as you say, a lot of it is common sense, but we’re often so much in a hurry we forget to think before pressing send. Email makes it too easy to send our gobbledygook to people. I like your dating analogy. Girls (and guys) really want to feel special when you email them or ask them out for a drink. And yep, of course, you’re right – you can use the first 3 questions to draft your email so it saves you a lot of editing time! That’s clear and concise . Makes you want to take action. Good luck, Malaika – hope this checklist helps you sell your online workshop! Awesome timing ! I sent out some emails last week that I’m waiting to hear back from. I did just what you said, read back through them. Eek. Boy, too long. Anyway, thanks for the tips—shall be using them with a couple of pitch emails I’m writing this morning. Have a great week! PS: I tried slideshare. (http://www.slideshare.net/Lisaesile/the-ultimate-guide-to-feeling-awesome1-41232759). This was on old article that I converted to slideshare so I didn’t alert my list, but instead just promoted it on FB. I like it enough to try it again, that’s for sure. Fun! Yeah, I bet we’ve all done it. Writing short emails is hard work, and it’s often difficult to see which sentences we can cut straight after we’ve written it. Leaving them “simmering” overnight before sending them can help. Yep, I guess you’re right. It’s a very helpful post! It usually takes me a long time to write my weekly email that I send to my list and now I see that I have a lot to improve! I especially like how you have shortened the blah blah emails. I never have patience to read through very long emails and usually quit midway. Thanks! I’m impatient with long emails, too. Some people seem to prefer blog updates in their email rather than having to click through, but I prefer short emails and then read posts on a blog. Really love the way your showed in the examples how to be more persuasive. Still need to work on cutting my words to 50% in my emails. Direct, to the point and the message received. One thing I noticed (and was taught at one point) about question #3: often the thing stopping someone from responding to your email is time. So, for your first “meh” email example, Johnny is asking for LOTS of time out of someone’s busy day. Who has 40-50 minutes for a presentation? I know I don’t. And why can’t the same info be condensed into 5-10 minutes (much like you’re saying our emails should be condensed)? If many businesses can get their point across in online videos within 3-5 minutes (or maybe longer, but not usually past 30 min. ), there’s no reason to sit through an hour-long presentation unless you’re employed by a company who’s in a business meeting with the Awesome App company. Yes, insane isn’t it? Why on earth would I spend 40 minutes on a demo for an app? Why not start with a 5 minute demo and if I’m seriously interested we can schedule a follow-up demo to go more in-depth? Good to see you again, Bree. Hi Henneke, more invaluable advice to add to the swipe file 🙂 keep it coming! Yes, it’s crazy isn’t it? Who has a free hour these days? There are much better ways to start a conversation. Henneke, those blah blah emails are outright painful! Great examples. My (very) general rule is 2 sentences to introduce myself and provide some context, then jump right into my request and why the other person should care. Basically just as you suggest here. It’s even better if the recipient can reply back in 1 sentence. Yes, those blah blah emails are painful, aren’t they? Still, they’re quite typical for the unsolicited email I receive. Most people don’t take the time to consider how an email will be received. They just consider their own perspective, and that’s where they often go wrong. Yep, good point about removing friction and making replies as easy as possible. After reading this, I’m realizing that I need to do some major work on my emails that I send out. I could do SOOOOOO much better than I’m currently doing. The persuasive emails were so much simpler than the other emails. Perhaps they uses key words or maybe even because it was shorter and to the point, but I know the majority of the emails I sent out before were meh and I need to work to make them more creative. I do know that 1st email with Johnny asking for 40 – 50 minutes of your time is really uncalled for. That’s just presuming that you’ll make time to commit to that, rather than ask you for when you’re available on your own time to make that commitment. Hmm, great lesson here actually. Yes, simplicity is the key – because it helps people to understand quickly what you’re trying to achieve and what’s in it for them. But simplicity isn’t always easy to achieve. As Leonardo da Vinci said, “Simplicity is the ultimate sophistication”. 1. Exactly what are you selling? 4. What do you want me to do next? The trust factor is really important, because the web is full of charlatans. Thank you for adding your thoughts, Jon. Pretty cool.. get to the point and send. Simple. Thank you so much. I’ll have to study this carefully. This should be required reading in Business Communications 101. Redundant words KILL my productivity in getting to inbox zero. I get so frustrated by reading “circular emails” that I have to archive ’em for later or just outright delete ’em. I tend to delete stuff that doesn’t get to the point quickly unless I know the person it’s coming from of course. Holy cow, this post is genius! I hadn’t visited here before but I saw how highly Kevin Duncan recommended your work and now I know why. This really is so simple, I feel dumb for not having thought of it sooner! It makes so much sense and I have a feeling it’s going to completely change the way I write emails from here on out. Keep it simple, get to the point, only say what’s essential. I love it! Thank you for sharing! Yes, I know, it’s crazily simple isn’t it? And it works for any email you write. I think the problem we all face is that’s so easy to write and send an email, we often forget to think about what we’re really trying to say. We almost write as if we’re thinking aloud and forget to take the time to re-formulate so our ideas are clear. I appreciate your posts and am about to compose my first marketing email, so reading this is the right time for me. That’s great to hear, Helen. Good luck with writing your first marketing email! Informative post at the right time when I was looking up for best practices on contacting people via email. My important take aways; how to write an effective call to action and how to make it clear “what is in it for them”. Thanks for the share. I have just tried these tips for my last prospecting wave and I had a much higher response rate than I had previously – thank you so much! That’s great to hear, Emily. Thanks so much for stopping by to share! This is just perfect . I love this …Many Thanks. Henneke. I love this post! I think this advice is great for email marketing and for those of us who need to learn to keep it simple when crafting emails, blog posts and articles. My favorite part is #1- Have a clear goal. Without that as your roadmap, where can you go? Yes, exactly – without a clear goal where just rambling on! I found out the article persuasive, Indeed! Wow! I enjoyed reading and learning this. I’ll try it. I’ll keep you posted on my winnings.